Entries from Digital Intelligence tagged with "bild"
Of the 379.4m Europeans who went online in November 2011, nearly half (47.8%) visited at least one newspaper site,, with a considerable number visiting the top 5 newspaper sites preceded by a visit to Facebook, according to new research. The study, from comScore, assessed Internet usage in 49 European markets aggregated into the European region. The Daily Mail attracted the largest online audience with 20.1m unique visitors, followed by the Guardian at 15.7m unique visitors. A total of 167.2 million unique visitors went to European newspaper properties in June 2011, up 11% from a year ago, with the UK's Daily Mail Online and Guardian leading the way. 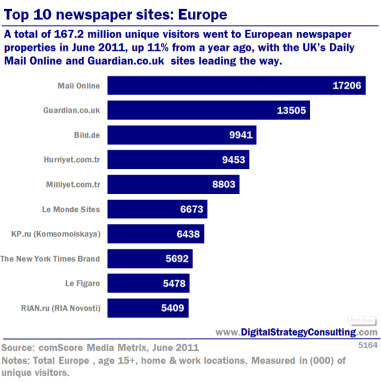 In June 2011, a total of 167.2 million unique visitors went to Newspaper properties in Europe, up 11% from a year ago, with the UK’s Daily Mail leading the way, according to new research. The data, from comScore, found European users spent 40.5 minutes on average during the month. The most visited Newspaper property in Europe was the British Daily Mail, drawing 17.2 million unique visitors who each spent an average of 25.9 minutes on the site.